Wincanton Lahnau Twinning Association has once again had a very successful twinning week with their German twin town of Lahnau. 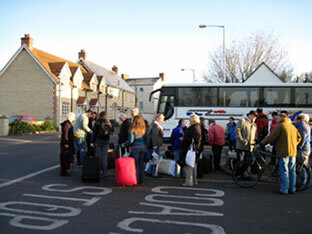 A coach of 29 people arrived on Monday 9th April at 3.30pm in the afternoon, after leaving Lahnau at 2.00am that day. We were all very pleased to greet them and each host family took them home for some food and rest, before embarking on a very busy week of activities. Two of their members arrived the day before after cycling all of the 992 kilometres from Lahnau. Frank Walter and Sabine Adams were the two cyclists. Sabine had to return to Lahnau the next day but Frank stayed on for the week. The programme we arranged for the week ran as follows. Wednesday Trip to the Bishops Palace and Gardens, Wells and our Civic Reception in the evening. Thursday A full day trip to Oxford with an open agenda. 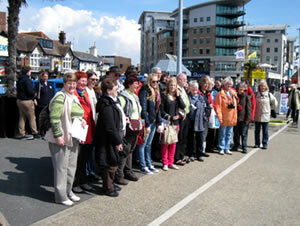 Friday Another full day to Poole with a trip on the Jurassic Boat around the Jurassic Coastline. In the evening it was Party Night at Cucklington Village Hall. Tuesday being a free day meant all hosts could take their guests wherever they wanted to. 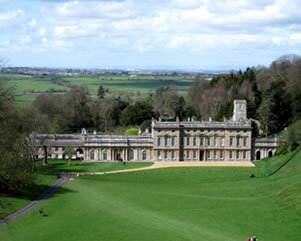 We took ours to Dyrham Park, a National Trust venue north of Bath. The weather was good but chilly and the house and grounds were spectacular. Wednesday dawned as another bright and sunny day. 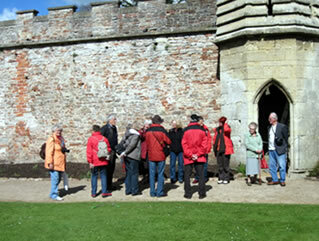 So off we went to Wells and a guided tour of the Bishops Palace and Gardens. This proved to be an excellent choice as the Town Crier was also out in Wells City as it was Market Day. The guided tour and talk lasted for almost two hours and was very informative and interesting (this I am told as I did not go on this trip). 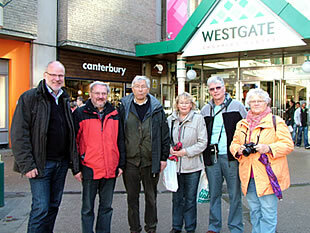 Our guests also had time to explore the city and do some shopping as well. 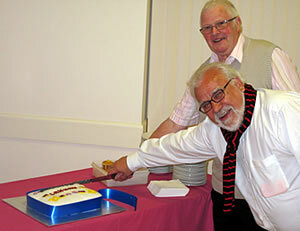 In the evening a Civic Reception which is hosted by Wincanton Town Council was held in the David Sharp Centre. This was attended by Colin Winder, Mayor, and Derek Lemon, Deputy Mayor. 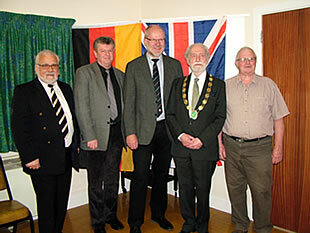 The Bergermiester from Lahnau and Geraberg (Lahnau's twin town in the former east Germany) also attended. The Bergermeisters arrived in Wincanton on Tuesday after making their own way here, flying into Bristol. As it was our 21st Anniversary there were speeches and presentations made by all Civic Leaders and Chairmen of each association. This was then followed by a wonderful buffet and glasses of wine. Again, it was a good evening for everyone. On Thursday a full coach set off to Oxford with no agenda for the day as it was a do-as-you-wish day. Elaine had prepared maps and information sheets for everyone and these proved to be very useful, trying to find your way around the streets of Oxford. The colleges, botanical gardens, and shops proved to be very popular with all. Everyone agreed it was a lovely day out and a good time was once again had by all. The weather was very kind to us with much sunshine. Friday, and Poole was our destination for a full on day of shopping, fish and chips, a favourite with our visitors, then a three-hour boat trip around the Jurassic coastline. Once again the weather was just beautiful with lots of sunshine. There was a chilly breeze on the water but the sun was shining and everyone enjoyed this trip and the occasion. The Jurassic coastline is very interesting and our guide was very informative. In the evening we had a very informal party with games, some wonderful food and wine once again. This was a chance to catch up and have a chat about the week and talk with friends made during the week, old and new. The cake in the photo was to celebrate our 21st Anniversary of Twinning and was cut by the Chairman of Wincanton Association Philip Rodgers and the chairman of Lahnau association Rudi Tonigold. This evening was very well attended. Saturday once again was a free day and everyone went their own way for the last time. Many of our visitors went to the 'Taste of Food' event at Wincanton Racecourse, as this was something different for them to see and also try lots of locally produced foods. We actually took our guests to Street to get shoes, as Clark's shoes in Germany are very expensive. All too soon Sunday dawned and it was time to say goodbye. We all had to be at the coach for 7.00am to pack the coach for a 7.30am prompt leave from Wincanton, to catch the ferry across the water home. They arrived in Lahnau at 21.30. Goodbyes are sad, especially if you have all had a good time like we did. New friendships were made and old ones were fondly established once again. We now look forward to our return trip to Lahnau in 2013. 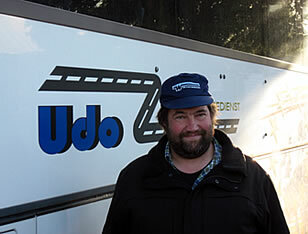 Our thanks to Udo who did all the driving this week for us. Also to everyone who made this the fun week it was. Anyone who wishes to join our association and come on the trip to Germany next year please contact Phil Rodgers, our Chairman, on 01963 32508.